Beard Balm ~ With Love and Co.
Ah-mazing! Stumbled upon your booth at Tivoli Village and the guy in the booth saw my beard and asked if I needed any beard balm. As a matter if fact I did, but stuck to my regular stuff. 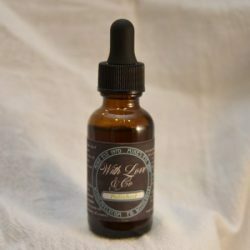 I took one smell of the With Love beard balm and had to have it! It smells of chocolate, coffee and vanilla. All of my most favorite things in the world, but it’s not overpoweringly strong and won’t dominate any other scents you might wear. I will be back for some more soon.